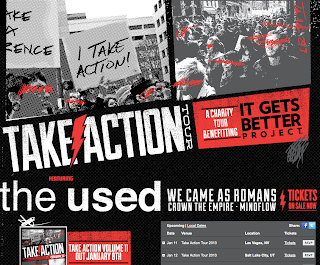 Bert McCracken and Jeph Howard (of the band The Used), are going on tour - the TAKE ACTION TOUR - in the USA to raise money for the "It Gets Better" Project! Take Action Tour is put on by Sub City (the non-profit arm of Hopeless Records) and raises awareness and funds for various non-profit organizations each year - they've raised over 2 million dollars for charities across the globe. 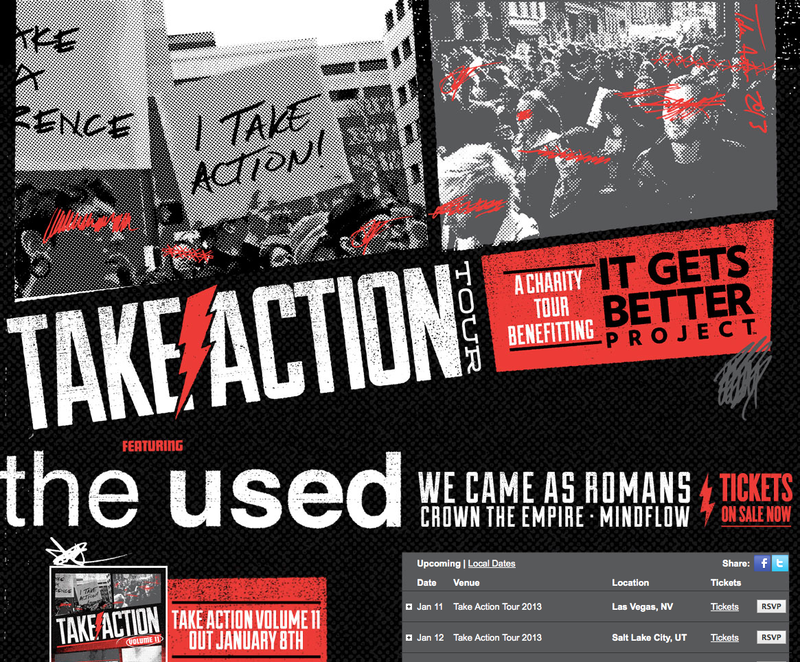 And this year the tour will be headlined by The Used (with support from We Came As Romans, Crown The Empire, and Mindflow) and will benefit the It Gets Better Project. It Get Better Project is a place where young people who are lesbian, gay, bisexual, transgender or struggling to find themselves can see how love and happiness can be a reality in their future. To learn more about the It Gets Better Project check them out here: http://www.itgetsbetter.org/. It sounds like a great Alt-Rock good time for a good cause! On Monday March 4, 2013 I heard from the organization that they raised over $95,000.00 for the It Gets Better project from the music tour and sales of the music!